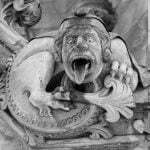 Whether echoes of our pagan past, ostentatious displays of plumbing, or enigmatic spiritual guardians – the mysterious carvings on some of our most significant buildings have terrified and intrigued us for centuries. 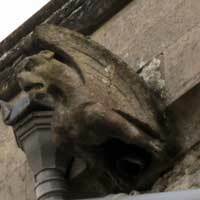 JAMES WILLIS takes a look at the Gargoyle. 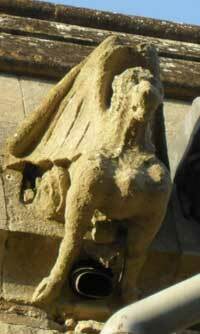 Gargoyles, Chimeras and Grotesques crawl, slither and perch upon countless ancient churches throughout Europe. At night, they were once believed to come to life, flying and gamboling around the ramparts. With the rising of the sun, they would return to stone. The original Gargoyles were nothing more than highly elaborate water spouts, steering rain from the building to protect its foundations. In time they were joined by equally hideous, non-functional effigies such as Chimeras (amalgamations of real and imaginary creatures) and Grotesques (a catch-term for such statues). Whilst such fixtures can be traced back to ancient Greece, it was during the 1200’s that they really came in to their own in Europe. It is likely that Gargoyles were used by the Church to attract and caution the illiterate:they stood as a reminder of the ubiquitous horrors of Satan, offering a stark contrast to the effigies of saints, stained glass depictions of Christ, and holy tranquillity that lay inside the Church.If the interior of the Church represented Heaven, then the outside emphasised the evils which would torment the damned. Grotesques also appealed to the folk memories of pagan gods, demons and unclean spirits: just as the Church assimilated other primitive native beliefs (for example building churches upon pagan holy sites, or scheduling Christmas to coincide with the ancient winter solstice), so too could the horrific stone monsters, animals and para-humans provide familiar and understandable religious imagery, easing the transition from the old faith to the new. 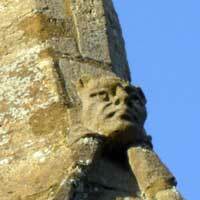 As holy guard dogs, now pressed into the service of Christ, the Grotesques protected the church from evil spirits. Some of the effigies, particularly the ones placed high up and out sight–are frequently engaged in bottom picking, copulation or other general depravity: these deviant monsters are thought to be subversive caricatures of Cathedral officials and local dignitaries, perhaps cast as private jokes, retribution for unpaid fees, or simply out of mischievous juvenile humour. Others might have been secret tributes to relatives of the carvers, immortalised on holy buildings and unknowingly paid for by the Church. The fashion for adorning buildings with Gargoyles began to die out in the 1300s (the images accompanying this article are typical end-of-era examples, and can be found at All Saints Church, in Milton Keynes Village – a fourteenth century oasis surrounded by the modern metropolis) but they made something of a comeback during the Victorian gothic revival. Today, Gargoyles, Grotesques and Chimeras are once again ascending buildings, hiding away in quiet garden corners, and standing guard upon gate posts. These contemporarygarden-centre grotesques, however, are more likely to be mass produced from concrete or resin than hand carved by master stone masons. Never the less, they do still offer a glimpse of otherworldly, pre-Christian menace to enrich otherwise soulless modern suburbs. JAMES WILLIS is the author of ‘Mysterious Milton Keynes’. I love gargoyles, they should be compulsary on all new-builds! Great article, I didn\’t realise there were such old buildings in Milton Keynes. Do you dare venture into Hell Fire Caves? The Hellfire Caves are steeped in dark history and super spooky.